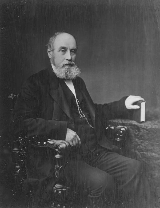 Sir John William Dawson’s time as principal of McGill (1855-1893) was one of great transformation. When he first set foot on the campus in the autumn of 1855, it was a jumble of buildings that were half-finished (or half-ruined, depending upon one's perspective) and overgrown by weeds and bushes. Dawson took it upon himself to revitalize the place, laying out walkways and planting trees at his personal expense and toil. He reinvented the University in other ways, too, personally indexing the library’s holdings and taking on teaching as well as administration duties. Realizing that a great university relied on a great primary and secondary educational system—“Those who do enter on a college course,” he noted, “often arrive too young, and with a too slender amount of previous education”—he founded the McGill Normal School to train teachers who could turn young minds into university material. In other words, his reputation as “the man who made McGill” is well-deserved. So it’s surprising to remember that the University’s board of governors were initially “startled and disappointed” when then-Governor General Sir Edmund Head recommended that the school’s reins be handed to this unknown young geologist from Nova Scotia, rather than a “man of mark in England.” But it may have been this "outsider" status itself that helped Dawson move McGill away from Old World models. And his own passion for science was certainly a deciding factor in establishing the fledgling school as a hotbed for scientific inquiry. William Dawson may have been an unknown quantity in the eyes of the McGill board of governors, but he came to McGill with an excellent reputation among the international scientific community—despite a formal education that consisted of a single course in “natural philosophy” at the Pictou Academy and one semester at Edinburgh University. As a teenager in Nova Scotia, Dawson was a geology buff with an unquenchable curiosity. In the late 1830s the lad ventured into the “remarkable cliffs” of Joggins, Nova Scotia, where he found a wealth of fossils. In 1853, the famous British geologist Sir Charles Lyell visited Nova Scotia and was astounded by Dawson’s largely self-schooled scientific education. Dawson guided Lyell through the Joggins cliffs, where the pair identified what stands as the oldest known reptile, Hylonomus lyelli, groundbreaking evidence that reptiles, birds and mammals have common ancestry. (That discovery electrified the international scientific community and earned Joggins a mention in Charles Darwin’s On the Origin of Species.) Lowell recommended Dawson to the Geological Society of London, and the young autodidact soon began publishing papers in its Quarterly Journal. Dawson’s passion for discovery did not waver during his almost 40 years as principal of a rapidly growing McGill. He spent his summer vacations doing strenuous field work, returning many times to Joggins and other sites around the globe—always with new treasures for the University. His curiosity spanned more than geology, too, and he published widely in botany, zoology, archaeology, agronomy and linguistics. A great advocate of useful employment over mere amusement, he even kept a tray of unclassified geological specimens on his office window-sill—just in case he ever found himself with a spare moment.